The Queen paused to greet well-wishers after arriving in Malta. The Queen and the Duke of Edinburgh have arrived in Malta to mark their 60th wedding anniversary. They lived on the Mediterranean island during two years at the start of their married life. The couple took a short walk through the Upper Barrakka Gardens in the capital, Valletta, and met Prime Minister Dr Lawrence Gonzi. The Queen paused to plant a tree and greet well-wishers before the royal party retired for the evening. Earlier, as the monarch got out of her car near the Maltese stock exchange, she was greeted with a shout of "God save the Queen!" by a member of the crowd. The royal couple met couples celebrating their diamond weddings this year, along with some who had been married for 30 years and others who were marrying this week. Robin Hughes, who married his wife May 60 years ago, said: "I told His Highness that we used to dance in the same ballrooms together when we were courting and he said, 'For a minute I thought you were going to say you danced with me!'" Maria Porsella-Flores, who married her husband Joseph two days after the royal couple, said: "We were delighted to meet her for the first time in our lives. She congratulated us on our anniversary." The couple are making a brief visit to the island en route to Uganda for an official Commonwealth trip. The stay in Malta - billed by some as a second honeymoon - is reported to have been the Duke of Edinburgh's idea. The Queen and the duke celebrated their diamond wedding with more than 30 family members and 2,000 other guests at Westminster Abbey on Monday. The service featured a reading from Prince William. In his sermon, the Archbishop of Canterbury, Rowan Williams, said: "Today we celebrate not only a marriage but the relationship between monarch and people of which also that marriage is a symbol." The service was also attended by Prime Minister Gordon Brown and two of his predecessors in the job, Sir John Major and Baroness Thatcher, as well as 10 couples who married on the same day as the royals. The couple's wedding was at Westminster Abbey on 20 November, 1947, and they lived in Malta between 1949 and 1951, where Prince Philip was stationed in the Royal Navy. 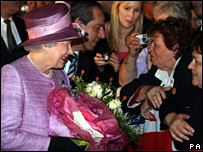 The Queen is known to have fond memories of her time on the island before taking on the responsibilities of office, and the trip to Malta is thought to be the highlight of the anniversary programme. The Queen, who became the island's monarch after inheriting the throne aged 25 in 1952, will be the guest of the republic's government. Malta gained independence from Britain in 1964 and became a republic in 1974.